JaDine fans got an overdose of kilig at the "JaDine Live in Pampanga" concert on Saturday, August 5, but they had more than one reason to feel all the warm and fuzzy #feels: Nadine Lustre's parents not only showed up—they also made a bold, supportive statement. 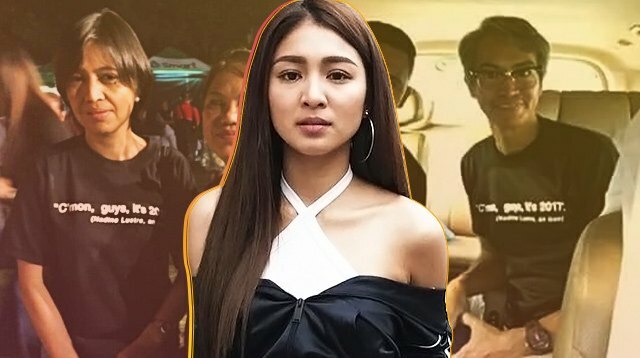 Fans spotted Nadine's dad Ulysses Lustre and mom Myraquel Paguia-Lustre (along with James' mom) in black statement shirts that read, "'C'mon guys, it's 2017. '(Nadine Lustre, an icon)." The statement most likely referred to Nadine's response to rumors that she and James have been living together. While she neither confirmed nor denied the rumors, she made her stance on cohabitation pretty clear. "I mean, if that was true, so what?" she told ABS-CBN News. "Come on, guys, it's 2017!" Although her statement sparked huge debates among netizens, Nadine herself confirmed that the rumors didn't bother her parents anyway. "My parents and relatives know me," she told The Inquirer. "I don't hide anything from them."